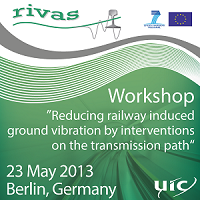 On 22 and 23 May 2013 two workshops were organised in Berlin and moderated by Isabelle De Keyzer, in charge of Dissemination of EU co-funded R&D projects at UIC HQ with the objective to disseminate the methodologies and approaches of the UIC led project RIVAS to the interested audience. RIVAS stands for ‘Railway Induced Vibration Abatement Solutions’ and focuses on the development and testing of mitigation technologies for vibration from rail traffic. More than 70 participants from 15 European countries gathered in the stimulating atmosphere of the historical industrial complex ‘Die Schmiede’ in Berlin. Among them there were many representatives of railway companies, suppliers and consultants as well as academia and standardization bodies. The first day was dedicated to reducing railway induced ground vibrations with mitigation measures on the track. Starting with an overview of the work carried out within RIVAS on track optimisation, the different fundamental phenomena at work in the track were introduced. Numerical models for the prediction of ground-borne vibration were discussed and how they can be applied for the optimisation of track components. Prototypes of optimized resilient elements in combination with appropriate design of the rail fastening system and sleepers were introduced and the first measurement results from laboratory testing were presented. The influence of track defects on vibration generation was shown and possible reduction measures due to optimised track maintenance were discussed. The second day focussed on reducing ground vibrations by intervention on the transmission path. The fundamental facts governing the transmission of ground-borne vibrations through the soil were explained as they play a major role in design and performance of barriers to surface waves in the ground next to a track. Appropriate measurement procedures for ground-borne vibration have been defined within RIVAS and the subsequent steps for estimating their impact on exposure in buildings and the associated reduction of annoyance to residents have been developed. Various designs of barriers in the ground including jet grouting walls, sheet pile walls and soft trenches have been studied in detail by state-of-the-art computer simulation and based on these results, appropriate test sites were identified. It was demonstrated to the audience how the combination of computer modelling and geotechnical characterisation of ‘vibration hot-spots’ may be used in practice for optimising vibration mitigation measures. Ample time was reserved for discussion which was extensively used by the participants showing the growing interest in the subject of reducing vibrations and also vibration-induced noise as these two issues attract increasing attention in the wider context of further increasing environmental-friendliness of rail traffic. For further details please visit the RIVAS website at www.rivas-project.eu.